Parkway is a unified dress code school. All students are expected to dress in uniform style with our specified colors each day. Parkway's uniform colors are Black, Gold, White, Navy, and Khaki. More information about appropriate school attire will be distributed at the orientations prior to the start of school. 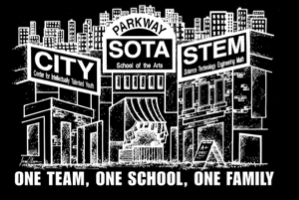 In addition to the school uniform, students ARE permitted to wear Parkway t-shirts and attire. Our school PTSA and drama booster POPP will be selling acceptable items at our orientations on campus. Below are items that are currently for sale by POPP (Patrons of the Parkway Players). These items can be pre-ordered below or purchased on site with cash at orientation. Items pre-ordered by July 31st will be ready for pick up at orientation. We will also be selling old school and show shirts at a discounted rate while supplies last. Sweatpants come in adult or youth sizes. They are black with the troupe logo & number down the right thigh. All sizes have elastic cuffs at the bottom. Adult sizes have elastic waists with a drawstring. Youth sizes do not have a drawstring. Cash purchases are $20 each. Online sales include a $2.00 processing fee, totaling $22.00 per pair.